For hygienic ear and nose piercing services. 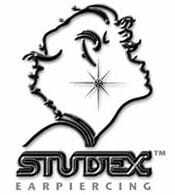 We use the STUDEX system, which is one of the finest Disposable Cartridge Ear and Nose Piercing instrument available. All jewellery is nickel free as nickel is often the major cause of allergic reactions. The spring action plunger snaps the stud through your earlobe in 1/10th of a second and automatically installs the clasp properly. This not only reduces the possibility of discomfort, it also promotes proper healing. When pierced, the earlobe takes 6-8 weeks to heal and the upper ear or cartilage area takes 8-10 weeks. A nose piercing may take up to 11 weeks. These are approximate healing times and vary according to your age, health and care given to the pierced area. With each piercing you will receive a FREE 60 ml Antiseptic Spray that must be used in accordance with the instruction sheet supplied to you at the time of piercing. The nose is also pierced quickly and hygienically. You will be given a FREE Antiseptic Spray to take home to help keep your new piercing sanitized. You'll also receive an instruction sheet to help you care for your beautiful new piercing. Remember to wash your hands every single time before you touch the newly pierced areas. Salon policy. You must be over 10 years of age and be accompanied by an adult to have ear piercing performed and be 16 or over for a nose piercing. We can do both ears at once but you must pre-book this service.